Join me on this trip, and you'll visit Muang Songkhla in a one day trip! There are many nice places and things to visit and see, such as Samila Beach, Tangkuan Mountain, Old town, Street Art and Wat Matchimawat (Temple). Let's go! 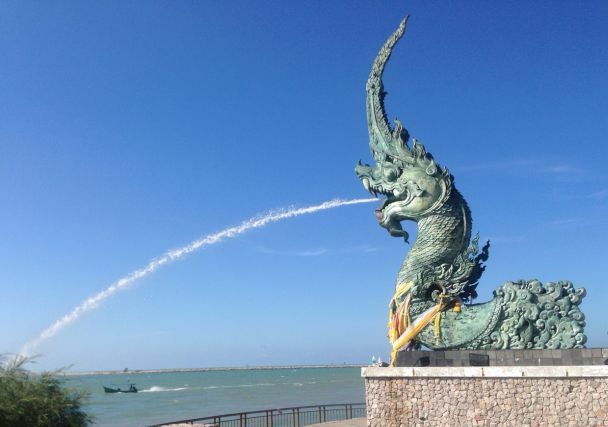 Let's go to Songkhla city to see the Serpent Dragon at Two Seas Garden. (Lake and Sea). Then, visit Samila Beach to see The Golden Mermaid Statue, and see two islands called Koh Nu and Koh Meaw (Rat and Cat islands)! Let's go to Tang Kuan Hill, which is 105 metres above the sea! Good views in Songkhla, consist of the ancient Pagoda (Phra Chedi Luang) and visit the house of king Rama IV (Take a lift right up to the top! The price is included in the ticket for you). Let's have lunch (Local food) at Songkhla old town area. Let's go see some cool street art at Nang Ngam Road (Old town area)! Afterwards, let's visit the red building called Hub Ho Hin and Ban Nakorn Nai Museum, which is the old chino-colonial building turned to a local museum with a collection of Chinese furnitures, beds and ceramic pots! Visit Wat Matchimawat, also commonly called Wat Klang. It's one of the oldest and largest temples in the city, thought to be founded 400 years ago. And also visit National Museum in there. Take a break at coffee shop. The trip ends when I drop you off​ at​ your hotel​ in Hat Yai area! Thank you for joining me, and I hope you enjoyed the time! Your pocket money, alcoholic drinks. This trip is a travel variety program(flexible), You will have the best vacation experience with a good quality for the price. Hat or Cap, Sunscreen Cream, Pocket money. Pin is very attentive to my needs during the trip. She asks about my needs for break and even offered to take photo for me at every place of interest ehen my phone battery was low. She is very prompt in responding to the takemetour messages and also sent me the photos within the same day after the trip. She also provided very good insights of the places of interest & it was a different experience to go around with a local. Thank you for the kind words. I wish you happiness ! See the Nature of Hat Yai: Ton Nga Chang Waterfall & Loads More! Dinner with a Local Expert- a Tour of Hat Yai City!